It’s show time! 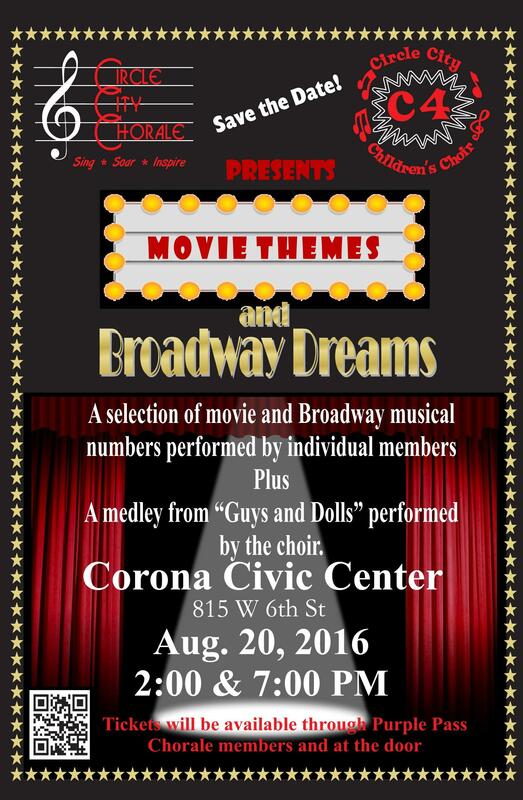 Join Circle City Chorale (C3) and the Circle City Children’s Choir (C4) as they celebrate the music of Broadway and the movies. Members of these two talented groups join together for a lavish production of this exciting music featuring solos and small groups from within our ranks. Featured songs will be performed from classic musicals such as Hello Dolly, Kismet, and the Sound of Music to newer musicals and movies including, Toy Story 2, Shrek-The Musical, and Pitch Perfect. C3 anchors the performance with a medley from Guys and Dolls. This has always been an exciting show where members showcase their abilities and the audience gets to experience the wonderful talents possessed by the individual singers. (Between you and me, the children are amazing and NOT to be missed!) Circle City Chorale was founded in January, 2010, under the direction of Angela Rosser, with about 20 members. Now with almost 70 singers plus accompanists they put on a memorable show. Circle City Children’s Choir was formed in Fall, 2014. They are a bright symbol of what music can give to young lives. $2 more at the door! Tickets are available through PurplePass beginning July 11, 2016! Summer 2016 – Vocal Workshops!